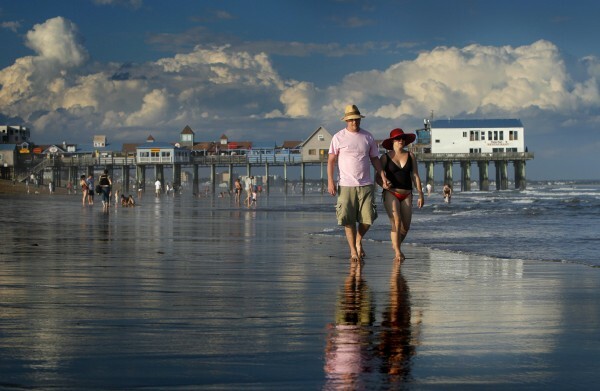 Dan Horner (left) and Cynthia Belaskie of Toronto stroll along the ocean in Old Orchard Beach in 2010. OLD ORCHARD BEACH, Maine — A Canadian flag flies beside an American one outside the beachfront Friendship Oceanfront Suites motel, beckoning tourists from north of the border. Inside the rooms, the motel’s rules are spelled out in English and French, the predominant language of Quebec. With Memorial Day weekend marking the unofficial start to the summer tourism season, businesses have high hopes that the strong Canadian dollar will bring lots of Canadian travelers to northern New England. A decade ago, when the Canadian dollar was worth about 65 cents in U.S. currency, Canadians made up about 25 percent of the Friendship Oceanfront’s customers, said owner Dan Donovan. Nowadays, the Canadian dollar is worth a little more than a U.S. dollar, and Canadian visitors make up nearly three-quarters of the customers. Donovan is expecting another strong showing this year. Northern New England states — Maine, New Hampshire and Vermont — all rely heavily on Canadians for business. In Maine last year, about 4.4 million Canadians made overnight trips, accounting for about 19 percent of all overnight visits. Old Orchard Beach has been a Canadian summer destination for decades, its miles of white-sand beach a half-day drive from Quebec. It’s that French-Canadian connection that gave rise to motel names such as the Kebec and the Beau Rivage. But the number of visiting Canadians fell through the years as the loonie, the popular name of Canada’s dollar coin that features a loon, tumbled in value. This spring, it has been worth $1.01 to $1.05. With that increased buying power, innkeepers, restaurateurs and merchants are anticipating a strong Canadian presence this summer. Here in Old Orchard, a sign on the window of Ramunno’s Pizza and Grill advertises poutine — french fries with cheese curd and gravy that is a favorite among people from Quebec. Karen Ramunno didn’t sell it when she bought the place 12 years, but she added it to the menu a few years ago when a growing number of Canadian tourists asked for it. Ramunno isn’t overly confident about the tourist outlook this summer, given the high gasoline prices and the fragile economy. But the Canadian influx has her hopeful. While high gasoline prices may have Americans driving less, they shouldn’t deter Canadians because U.S. gas prices — even at close to $4 a gallon — are a bargain compared to what Canadians are paying at home, said John Mahon, a professor of management at the University of Maine. Gas prices in Canada are roughly $1 a gallon higher than in the U.S.
“With the conversion rate, they’re making out like bandits. If I were coming to Maine, I’d come with a few extra containers for gas,” Mahon said. Even better for Northern New England’s tourism industry: The low value of the U.S. dollar in Canada and high gas prices might combine to keep New Englanders closer to home, said Ross Gittell, a professor at Whittemore School of Economics at the University of New Hampshire. Tourists are now starting to trickle in to Old Orchard Beach, and Canadians will come in earnest beginning in July. Besides putting up a Canadian flag and making sure things are spelled out both in England and French, Donovan is doing one more thing to prepare his 71-room motel for what he hopes will be a busy summer.